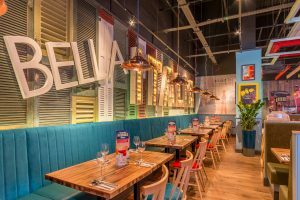 A Bella Italia has recently opened in Orpington; I decided to take a trip with a friend and our children and put it to the test! It has a prime spot in the Walnuts shopping centre, next to the new Odeon cinema. Orpington is currently undergoing a £15 million regeneration, so there’s lots going on. What better place to open a Bella Italia?? We were greeted at the door by helpful staff, who showed us to a booth, and set up the high chairs for the kids. The restaurant is spacious and colourful; warm and inviting. You get a real sense of fun, and it oozes the vibrant sights and sounds of Italy. We were spoilt for choice with the menu; it’s huge! Lots of tempting meals to choose from. 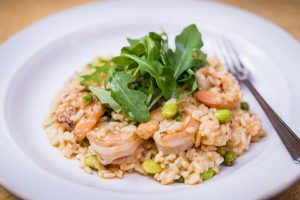 I went for the Gamberoni Risotto (plenty of king prawns, and delicious) and my friend had the Cannelloni Ricotta (piping hot, and tasty). The kids menu is just awesome! 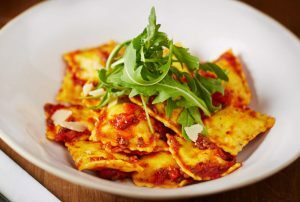 It’s split into 2 sections; the Piccolo option at £5.45 (perfect for 2-6 year olds; simple and flavoursome treats) and the Grande option at £7.95 (perfect for 7-11 year olds; exciting flavours for growing kids). Both options are for 3 courses includes a drink (free refills on squash) and nibbles. 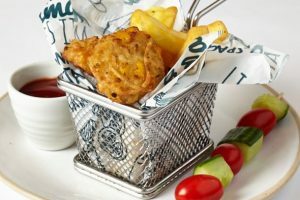 The Veggie Dippers, Squiggly Spaghetti Cake (crispy spaghetti cake with sweetcorn in a cheesy sauce, served with chunky chips) and mini doughnuts were a definite hit. 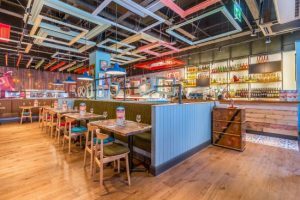 It’s so important to feel welcome when you’re taking children out for a meal… it very rarely goes smoothly and meltdowns can be par for the course! Both children who were with us had their “moments”, but we never felt like all eyes were on us in a “why did they bring their kids here? ?” kind of way. We never felt rushed (we were there for 2 hours!) however if you were in a rush (to go to the cinema, for example), just let them know and they can speed service along for you. Baby changing facilities are good; they are located in the disabled toilets so great for either parent to use. Good baby changing facilities are essential, and I always like it when they are in a large separate room rather then shoved into a cubicle in the ladies. Top marks, Bella Italia. We finished our coffees and – after chasing the little ones around the restaurant a couple of times – it was time to go. 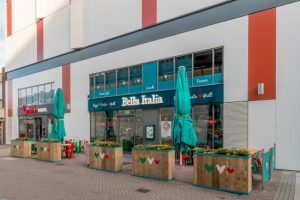 Our visit to Bella Italia in Orpington was relaxed and tasty; great if you have little ones with you or for a casual lunch/dinner with friends.